Ron Steel was probably the first college lecturer appointed to teach swimming pool and recreation management in the UK. He was formerly employed by Lewisham Borough Council before taking up his role at the South East London Technical College. Ron passed away in hospital after a short illness on Sunday 12th January 2014, 3 days after his 81st birthday. Until more recently, he spent much of his time visiting Croydon Library and planning his food shopping around a rota of supermarkets where he had located a variety of checkout operators, mainly from Eastern Europe upon whom he could practice his linguistic skills, a different language for every day of the week. All who knew him remember him as a private, independent but friendly gentleman with a dry sense of humour, who could still become animated if conversation strayed towards politics or the current condition of Heart of Midlothian FC and enjoyed exchanging calls, notes and cards with old friends and colleagues. We will always remember Ron……. I will always remember Ron (swing that lamp) with great affection, as he was a remarkable man and truly was a legend. We will all remember his humour, as it was one of his key attributes but it was also his skill and assiduity as a top lecturer which helped so many of us get through SELTEC and out the other side, as fully fledged young IBRM/ISRM Professionals. Sorry to hear this news. He was certainly a one off who influenced so many careers. Very sad. Ron must have influenced so many and so well across the UK leisure management sector. He certainly enabled a change in the direction of my career which would otherwise almost certainly not been possible, and to meet many of the colleagues on this list. RIP Ron. The passing of a legend, he will be sadly missed and particularly from us old SELTEC boys and girls. I only met Ron once at a National Conference and remember very clearly his quiet humility, warmth and genuine interest he had for ‘youngsters’ like me and my fellow colleagues like Phil, Jill and Anita. He reminded me a bit of my own father and he gave a priceless gift which was his ‘time’ for others to develop their knowledge and skills. Judging from the many emails and comments that have been sent, I think Mark’s words were quite profound in that “he was one of us”. Ron was a great character and was my mentor when I worked with him at SELTEC back in the late eighties. I will miss him. Ron was one of us through and through. His legacy will go on. Sad news indeed. A lovely letter from his landlord who also seemed to be a good friend. Thank you for letting me know. Many of us have a lot to thank Ron for. So sad to hear about Ron, he was a legend, so intelligent and had a dry sense of humour. He had a hand in starting so many people’s career in leisure. He’ll be missed by so many. Sad day indeed, he was a major influence on my working life. Like many others I was also a student of Ron’s, he called me scouse up until 3 or 4 years ago when he realised I was from the Wirral and I became woolyback when he wrote to me. Some of his lecture notes live on in material I and others have written in the past 20 years or so. Like so many of us who went through SELTEC , where Ron was so Instrumental with our career paths, I will be forever grateful for his help and advice and influence on me . I hope Ron passed away knowing just how influential he had been on so many careers within the leisure industry. A true gentleman and professional and a man who never asked for anything in return. He will be long remembered by so many. Rest in peace Ron – You touched so many lives during your own. RIP Ron, A sad day and the end of an era. Ron played a huge part in developing my career path and became a great friend and mentor post SELTEC. His legacy and influence lives on through the hundreds of students who passed through his courses. A great man, a friend and so much more to so many!! A sad loss to the industry!! Ron was a legend in the IBRM/ISRM/CIMSPA Southern Region teaching the Membership and Diploma membership exams at SELTEC and Lewisham College as it became known. Ron had a wicked sense of humour and strong opinions in the classroom but was a very modest and shy man outside of it. He guided many ISRM/CIMSPA members through their studies and exams knowing exactly how to ensure each individual could fulfil their potential. I remember presenting him with the first Southern Region Branch Service Award in 1997, huge turnout and a devil of a job to persuade him to turn up and accept it. He did so on the condition he brought his own lunch as ever! Many leading lights in the leisure business today owe a huge debt of gratitude to Ron Steel as does CIMSPA as Ron, with often limited resources, but with the help of Geoff Budworth, Liam Higgins and others produced some of the finest managers in Local Authority Leisure today. RIP Ron. Best teacher/lecturer/joke teller I ever had! I received an award at SELTEC after I had done my ISRM Diploma. Ron persuaded me to tell a joke that he thought would be appropriate for the acceptance speech on behalf of all the students. I felt I couldn’t let him down, although I didn’t really want to do it. Got through it but it wasn’t as good as if it had come from Ron! What a legend of a man and teacher! I will miss him and his Green Shield Stamp rewards! I have many wonderful memories of Ron. He was I believe, the first person to be employed as a lecturer teaching the subject of baths management and then recreation management. I had the privilege to be in his first block release course at SELTEC. Ron always inspired confidence and demonstrated a professionalism that underpinned everything that I came to know was and is the Institute. I have often thought about those early days and more recently with the passing of my old colleagues, Harry Hitchin and Noel Winter, I have come to appreciate the essence of their generosity and of the generosity of the many colleagues that supported others to progress in their careers. It was these people, and some of you that are reading this, that inspired me and others to teach and to share ideas and work to continue the spirit of the founders of the Institute. Organisations come and go, but it is the people that give of their time, their commitment and their inspiration that creates the memories we all share. I respected and cherished Ron for his quirky nature, his sense of mystery, that spark of mischief in his eyes, his charm, dedication, brilliance and his commitment to simply share with others his knowledge and time so that many could achieve more. Ron was certainly not your typical college lecturer. His humour greatly assisted in getting the message across during his sessions. It was a very long time ago when I attended SELTC, back in the late 1970’s. I quite expected him to publish a book with his vast knowledge of the industry. Sadly missed a great teacher and inspirational man. Taught me in the early 1970s’ provide a great start to a number of trainee managers. Happy days! Great to read these tributes to Ron Steel. I was fortunate to study at SELTEC under his mentorship in 1983/4, where being Scottish I was inevitably given the nickname of ‘Jimmie’, which he used in subsequent years of meeting at various ISRM functions. I attended the 1997 ‘award’ meeting mentioned by Marc Newey above, and remember Ron giving his acceptance speech in rhyming couplets as only he could. He had the large crowd in fits of hysterical laughter. I have only just picked up this sad news. 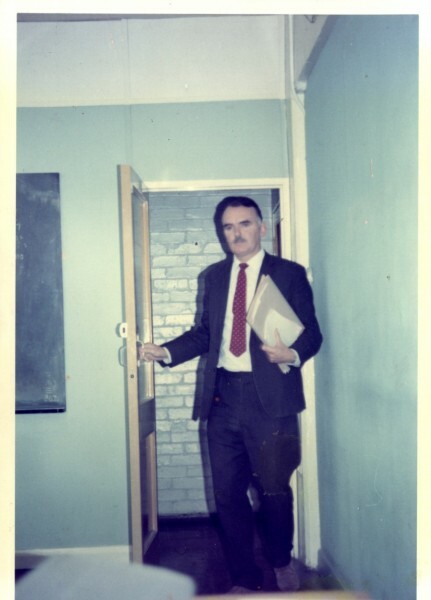 I had the pleasure of working with Ron from 1967 till the time he became a lecturer at SELTEC. I agree fully with all the comments made. He was a man of high intellect, but with matching humility. There were times, on a quiet Friday afternoon when he came into the office I shared and we would put the Baths and Recreation world to rights….but with such irreverence and humour! On the birth of my first born he presented me with a birth pack which I have kept to this day. It included a razer blade……although I can’t think why. I later completed my studies with him as my lecturer at Seltec. I remember I had a block over the spelling of the word ‘professional’…… I used to put to ff’s in it. Everytime he used to write in red in the margin…’yes, there is still only one ‘f’ in professional’A great man indeed.